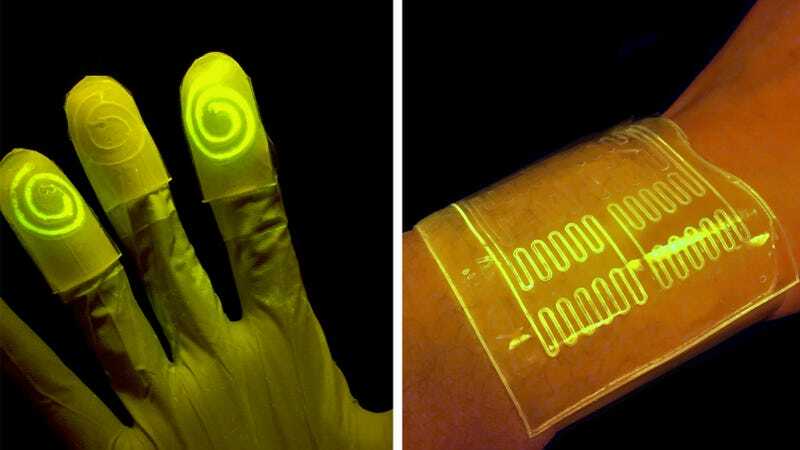 Imagine a near future when detectives looking for evidence in a murder investigation could slap on a pair of rubber gloves that would light up when the cop touched a certain chemicals. MIT scientists just created an early version of this technology, and it looks super cool. The bioengineering behind this new “living sensor” material is actually simpler than you might think. In a new paper published in the Proceedings of the National Academy of Science, the MIT team describes a new “hydrogel,” a material made up of 95 percent water that’s bonded to a layer of porous rubber that lets in oxygen. The material is then injected with a strain of E. coli cells genetically programmed to react when they come in contact with certain chemicals. (Most E. coli strains are perfectly safe, despite the bad reputation the bacteria gets from food poisoning outbreaks.) The reaction causes the cells to glow, essentially becoming a dead simple indicator of the chemical’s presence. The group also developed a theoretical model that will guide others who are keen on manufacturing their own, stretchy, glowing, life-infused, chemical-sensing materials. Honestly, who isn’t? “The model helps us to design living devices more efficiently,” Xuanhe Zhao, the MIT associate professor who led the research, said in a press release. “It tells you things like the thickness of the hydrogel layer you should use, the distance between channels, how to pattern the channels, and how much bacteria to use.” Zhao is referring to narrow channels in the hydrogel, fabricated using 3D printing and “micromolding,” that shelter the glowing bacteria. Then things get really interesting. Because the new type of material is stretchy and resistant to cracking, it can be fashioned into gloves or bandages that could have myriad usages in fields from medicine to environmental protection to forensic science. Imagine how those gloves could help a Homer Simpson sort of nuclear engineer realize when he’s touched toxic sludge, or a doctor to immediately see when a wound is becoming infected. Since the material is transparent and the bacteria can be injected in an endless array patterns, the implementation of technology like this could be wonderfully versatile. Of course, the MIT scientists are still in the preliminary research stages of developing this new living sensor. Zhao says that the basic design will enable people to “put different types of bacteria in these devices to indicate toxins in the environment or disease on the skin.” The team’s work joins an array of other exciting innovations in materials science, from electronic sensor tattoos that can be printed on skin to synthetic skin that can change colors like an octopus. It’s all a little freaky but undeniably awesome.